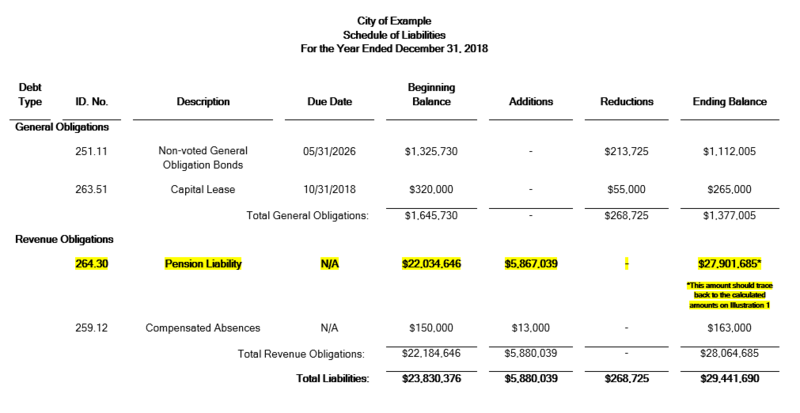 Starting with the fiscal year ended on or after December 31, 2015, cash basis local governments are required to report their pension related liabilities. This section provides guidance for accounting and reporting these liabilities. This implementation guidance focuses on local governments participating in the State of Washington cost-sharing, multiple-employer pension plans. However, the concepts are also applicable to single employer plans. Also, a short video providing additional guidance is available here. This guidance is intended to assist local governments in the implementation of the new pension reporting requirements. Local governments must apply their own professional judgment to determine if this guidance is appropriate for their facts and circumstances and must draw their own conclusions about the proper reporting. Government’s management is solely responsible for the content of the financial statements. Each local government is responsible for evaluating the information used to recognize and disclose pension amounts in its financial statements. Preparers must understand the underlying accounting and reporting concepts for pensions and retain adequate supporting documentation for all amounts reported. Much of the financial data necessary to report pension liabilities will be obtained from the State Department of Retirement Systems (DRS) at www.drs.wa.gov. Download the June 30, 2018, Participating Employer Financial Information (PEFI) report from the Employers section of the website. This report is published annually as of June 30. This report includes the Employer Allocation Schedules and the Schedules of Collective Pension Amounts for each pension plan. Employer Allocation Schedules: Each separate plan presents a schedule of employer allocations. The schedules are sorted by allocation percentage, largest to smallest, and you will need to search each schedule for your local government’s name. Note that the PERS 1 and TRS 1 schedules have separate sections for both the regular allocation and the Plan 1 UAAL allocation. You will need both allocation percentages. If you have more than one DRS ORG ID number, add the percentages together. What is the Plan 1 UAAL? Under RCW 41.45.060, part of the contributions to PERS 2/3, SERS 2/3, PSERS 2, and TRS 2/3 fund the UAAL’s for PERS 1 and TRS 1. Employers have a responsibility to exercise due care in financial reporting and to verify and recalculate amounts specific to them. Use the DRS eServices Contribution Reconciliation system, or some other reliable method, to verify the reasonableness of contributions used in the calculation of your proportionate share. Schedule of Collective Pension Amounts: The PEFI also includes the schedules of collective pension amounts for each plan. Employers will use the collective pension amounts and apply their proportionate share (calculated above) to determine their own share of pension liabilities (or assets). The use of this schedule is discussed further below. The Schedules of Collective Pension Amounts for each plan are published near the back of the DRS report. Important! The amounts in the schedules of collective pension amounts are presented in thousands. You must multiply the amounts by $1,000 to convert to whole dollars before calculating your individual amounts. For each plan in which you participate, multiply the amounts in these schedules by your unique allocation percentage to calculate your entity’s share of each plan’s pension liability (or asset). See Cash Basis: Pension - Illustration 1 for calculations. The calculated numbers will represent your government’s pension liability and pension assets at year-end. Only the total pension liability amount needs to be reported on the government’s Schedule of Liabilities (Schedule 09). Do not aggregate pension liabilities with pension assets. LEOFF Plans 1 and 2 include a special funding situation in which the State has a legal obligation to make contributions directly to the Plans. LEOFF Plan 1 is fully funded and there have been no contributions since 2000 and the State continues to make the contributions on behalf of the individual employers to the LEOFF Plan 2. Pension liabilities are reported on Schedule 09 under I.D. No. 264.30 – Pension Liabilities. Pension assets are reported only in the notes. For note disclosures see Note X, Pension Plans.